Continue along Ridgeway NT, up 0.5 mile hill and run to the next left turn arrow/ marshal just after Mile 2 marker at the public footpath sign before Foxhill radio mast. Run up the little grass hill, down a bit and up a bit again to reach Russley Downs Gallops. Run straight down the grassy Russley Gallops past Mile 3 Marker to Water Station 1./ Mile 4 Marker at the bottom of the Gallops. Follow the right arrow to run through the field gate leading to Russley Park Lane. Do not cross the M4 motorway bridge but follow the left arrow and marshal directing towards Russley Park (houses in distance). 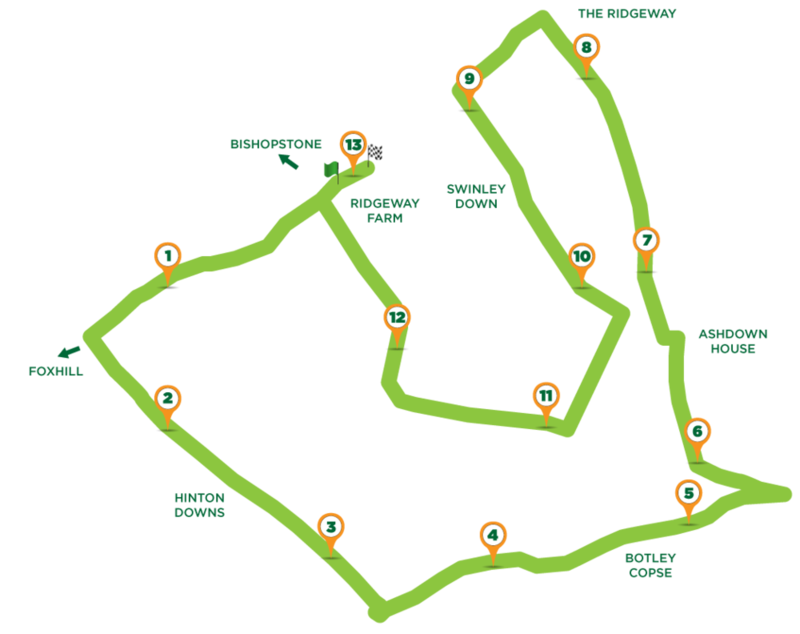 Enjoy nearly 1 mile of fast downhill/ flat road before until the HM/10K course divide/ marshal/ Mile 5. Continue straight on through the field gate to Botley Copse (do not turn left and follow the 10K course toward Russley Park). Keep straight on, past Botley Copse for just over 1 mile across rugged ground. Turn left at the arrow towards B4000. Turn left on to approximately 20m of the B4000 and take the sharp left through the gate with Water Station 2/ Mile 7 marker. Keep straight on and turn right at the arrow. Follow the arrows over the stile, up the next hill, turning right at the arrow. Follow the arrows turning left through a field gate and then right up a hill towards Ashdown House on the right. Continue following the arrows through public footpath gates keeping Alfred's Castle on your left. Follow the arrow through the next gate into the long wildflower/ grass field. Keep following the arrows through this field to the wooden kissing gate at the end. Turn left into the farm field and follow the footpath back onto the Ridgeway National Trail. Turn left onto the Ridgeway and continue to Water Station 3 at Mile 10. Turn left at the barn crossroads and follow the farm track all the way to the end. Follow the arrow through the gate onto the grass. Turn right at the arrow across the footpath through the field towards the trees. Follow the arrow through the gap in the trees and follow the arrow through the next field up the steep hill. Climb over the stile and follow the marshal directions/ arrow to the top of the ridge . Follow the arrows running right along the ridge until you reach the chalk descent to the finish. Descend the finishing chalk descent to the finish back at the start.